Photojournalist Werner Bischof died in a car accident in Peru in 1954. He was just 38. During his short career he created a wealth of images that portrayed the struggles of life not only in his native Switzerland, but around the world. The Minneapolis Institute of Arts presents a new exhibition of Bischof's work. The exhibit uses technology which may change the way museums present art to the public. Minneapolis, Minn. — When Werner Bischof died, his son Marco was just four years old. Instead of growing up with a father, Marco grew up with an archive. "I didn't know my father at all," says Marco Bischof. "But suddenly I had access to all the letters he wrote to my mother -- and he wrote a lot -- and he also wrote a lot of diaries. So I could also read these diaries and, of course, I learned a lot of details." Through those details, Marco says he feels he knows his father better than most children. Werner Bischof belonged to Magnum, the Paris-based photojournalists collective. 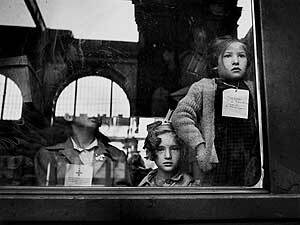 He worked alongside Henri Cartier-Bresson and Robert Capa. Bischof travelled through Europe, South America, Asia and the United States. After his death, Werner's wife Rosselina took meticulous care of all her young husband left behind. Photographs, proof sheets, negatives, letters, postcards, sketches and the diaries. Those diaries come to life in the Minneapolis Institute of Arts' latest exhibition. "Kyoto - Japan's old and only undamaged city. What I have seen in the last days could fill a book, from the enchanting silver pavilion, to the imaginary lake of moss, the mossy waterfall, a wildgarden stone buddha's covered in stone basins for washing hands...a thousand wonders." Werner Bischof's son Marco is a documentary filmmaker. He's dedicated much of his career to telling his father's story, through film, books and now, with a CD-ROM. The CD-ROM combines Werner Bischof's writings and images with interviews with his colleagues and mentors. It also contains historical and geographical information surrounding his assignments. It allows the viewer to visit Bischof's old studio and listen to music he enjoyed while looking at his photographs. Ted Hartwell, curator of photography at the Minneapolis Institute of Arts, says the CD-ROM is not just for photographers. "There's no talk about the technology of the photography," says Hartwell about the CD-ROM's content. "It's about the ethics and responsibility of journalism and reportage in the classic sense. And world events, and how a photojournalist fits into that whole thing. How they, as observers, sensitive and intelligent observers, can distill the essence of a situation and convey it to their public." The diaries reveal how Bischof thought as he approached different projects. "On Monday I start working on the famine story -- not an easy task because the government doesn't like having this documented. In the long run I don't think anyone can overlook these images of hunger, that people can ignore all my pictures -- no, definitely not. And even if only a vague impression remains, in time this will create a basis that will help people distinguish between what is good and what is objectionable." Curator Ted Hartwell says he'd like to use CD-ROMs to explore the lives of other prominent photographers. But he says creating such an elaborate teaching tool is too expensive for the museum at this time. Marco Bischof funded the CD-ROM of his father's work with help from the software designer on the project. Hartwell says while the MIA, like many museums, has often used computers to help provide background information for shows, this latest exhibition breaks new ground. "It has such depth and such dimension," says Hartwell. "Suddenly you come away knowing a lot more than just about Werner Bischof. You know about world history, you learn about a European travelling to India and experiencing the famine. And suddenly the artist that made these pictures takes on a human dimension." Exhibition visitors are invited to use the CD-ROM to explore Bischof's life before they enter the room with his prints. Hartwell says the CD-ROM actually teaches people how to look at the photographs. He hopes they will see the images with new eyes, and get more engaged in the work after hearing the artist's personal views. Bischof wrote at length about his art. "I must say that this work means a lot to me, because it has to do with life. And every day brings new thoughts, new problems that help you to stay flexible. It's not necessary to lose your sensitivity, but to save these things, man has to be saved first, and we are the enlighteners, the stimulating force that opens the eyes of our fellow man." Werner Bischof's son Marco is now 53, 15 years older than his father was when he died. For Marco, the CD-ROM is simply another medium for spreading his father's humanist message. "Werner Bischof was such an example, that everybody can learn something from him, from his life," says his son. "I think it's far more than just a couple of nice pictures that he made. Because with his writing and other things, I think we can still change a lot of things in this world and make it a better world. It's a small contribution to that." The CD-ROM is also available for purchase at the museum. The Minneapolis Institute of Arts' exhibition of Werner Bischof's prints runs through Feb. 15, 2004.